Osso buco is a classic dish of slowly braised veal shank served with a sprightly gremolata and accompanied by fragrant risotto Milanese. It’s a wonderful combination of flavors, but while a traditional osso buco is a thing of beauty, it’s not exactly weeknight dinner material. In my continuing quest to pare down the contents of our freezer and pantry before our move, I planned a quick and easy spin on that slow-cooking dish using the last of our suckled veal chops from Bobolink in place of veal shank. I mixed up the gremolata first, smashing and mincing two cloves of garlic and combining them with about a quarter cup of chopped flat-leaf parsley, the zest of one lemon, a pinch of salt and a tiny pour of extra virgin olive oil. I set that aside and got to work on the risotto, sautéing about a quarter cup of chopped shallot in a mixture of butter and olive oil until soft, toasting a cup and a half of Carnaroli rice, then adding the saffron (a good pinch – about 1/4 teaspoon), which I had lightly crushed between my fingers. I made a hot spot and let the saffron toast for a minute, then added half a cup of white vermouth and let it bubble away while I stirred the rice. I finished the risotto in my usual way, using a mixture of veal stock and water for my remaining liquid, while Mike seared the chops in the cast iron skillet (about 3-5 minutes per side). 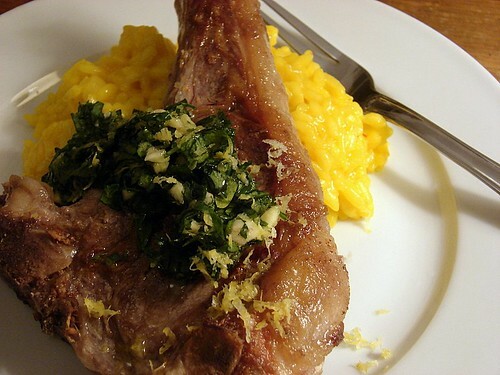 I added another blob of butter and a generous amount of freshly grated Parmagiano Reggiano into the risotto off the heat when it was done, then spooned some onto our plates, topping each portion with the seared chops and a big dollop of gremolata. This was a great way to get the bold, bright flavors of the traditional dish with minimal time and effort. That may be a “Not so Buvo” but definitely a delectable veal dinner. And in my house, anything with saffron is a good thing. I broke the bank and went ahead and bought a half an ounce of it. I felt like I was doing a boiler room deal with an undesirable for an by-the-half-OZ product I used to buy in the late, early, mid, 80s. You know…oregano. This looks fantastic. I’ve never cooked veal before — does it behave similarly to beef or pork? I love classic Risotto Milanese and the way the saffron is such a prominent flavor. Question: is there a reason you prefer Carnaroli rice over arborio? Donald – Thanks! I don’t use it terribly often but I’m always on the lookout for new recipes that use saffron. nice one jennifer. I actually made osso buco for the first time a couple of weeks ago and hubby and I got to find out how much we love veal. which was a LOT. 🙂 next time though, I should do something more like this (I made the buco on a wednesday and it *was* kind of rough for a weeknight). i was just thinking about gremolata the other day, when i was served some braised oxtail without any, which made me sad. i love recipes like this that capture the spirit of a classic dish without all the effort. plus, who doesn’t love risotto milanese?